Amid the now-annual calls from some outraged corners of Turkey's religious establishment and conservative press for Muslims not to celebrate New Year's -- a holiday that has taken on many of the outward trappings of Christmas -- the usual mashup of traditions continued to mark the occasion in Istanbul's Beyoğlu district, a historic hub for minorities and foreigners. On shopping thoroughfare İstiklal Caddesi, jam-packed crowds had braved the frigid wind and sleety rain to snap up last-minute gifts, including the red underwear and other lingerie believed to bring good luck in the coming year if worn on New Year's Eve. 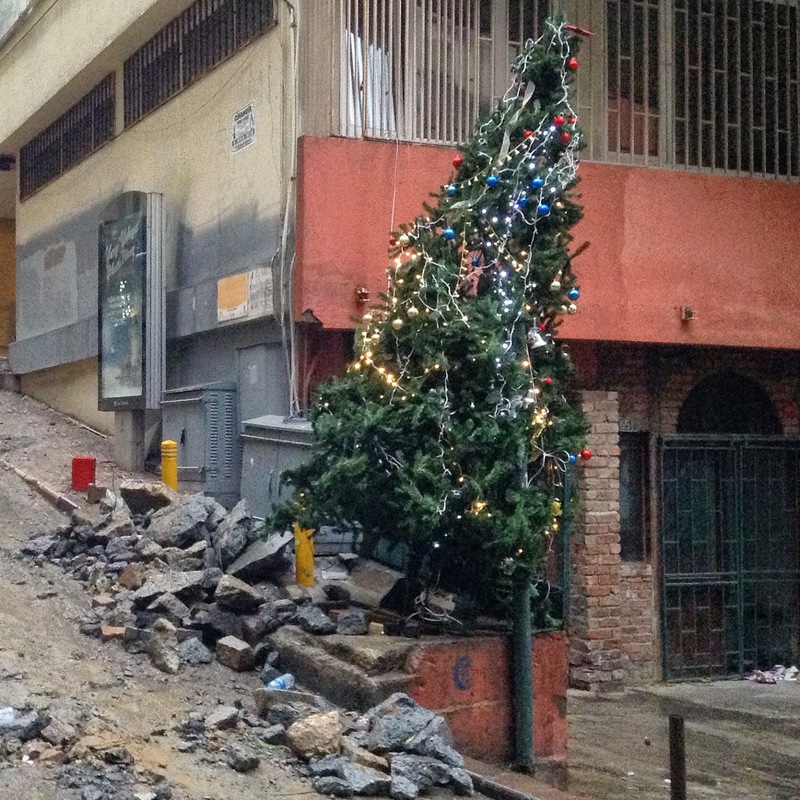 In the nearby backstreets, a lights-and-ornaments-bedecked tree made an incongruous sight on a drab, rubble-strewn corner. 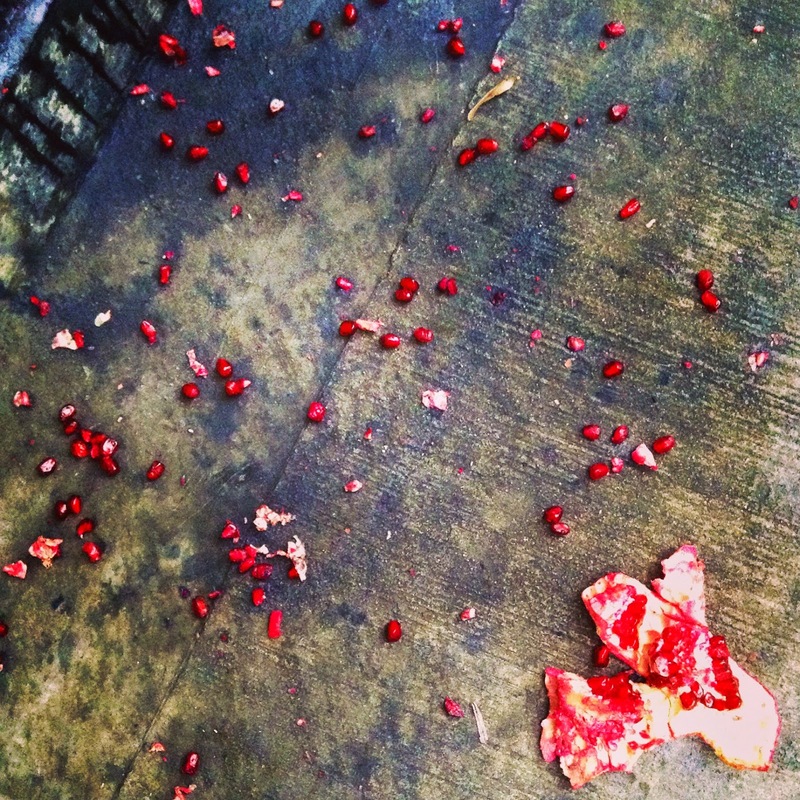 And the scattered seeds of a smashed pomegranate recalled the area's once-thriving community of Greeks, among whom tossing and breaking the fruit* as the new year arrives is thought to herald abundance and good fortune. Happy new year / Mutlu yıllar / Καλή χρονιά / Շնորհաւոր Նոր Տարի / Bonne année / Gutes neues Jahr ! Hmmm, Jen. The photos somewhat resemble a war zone. Watch those flying pomegranates! Take care and happy New Year to you, too from the senior dogs. Istanbul is not at its prettiest on these soggy, gloomy days, that's for sure...!